Shrek Director Vicky Jenson signs on as LAFSs newest Visiting Artist to make her first live-action short film, using the schools facilities and our students as her crew. LAFS Alumni Kevin Atkinson honored by ASC (American Society of Cinematographers) as one of their Best New Cinematographers for his work on True Jazz, a short film directed by a fellow LAFS Student. View reel. Current LAFS Student David Dooyun Kims article published in the current Moviemaker magazine, regarding his short film, The Parking Spot. View short. Winners chosen to helm Los Angeles Film School and Roger Cormans joint production of the feature film The Day of the Dead. All recent LAFS Alums, James Cotten, 27, will direct a script by Tristen Thai, 25, with Brandon Trost, 19, as Cinematographer, Travis Ramsey, 19, Line Producer, Evin Fiorentine, 23, Production Coordinator, Kambiz Hemati, 26, Production Designer, and John M. Valerio, 26, Editor and Sound Designer. 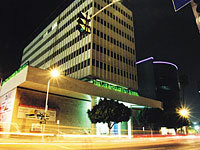 The Los Angeles Film School. View from Sunset Blvd; Klasky Csupo in the background. Looking for our flash site? You can get to it by clicking "flash website" image on the top right of the site. Screen your short in our theater. Friday Night Shorts is open to the public, for submissions as well as for attending. Next friday Night Shorts is August 16. more. Our next Immersion Film Program starts September 3rd. Our next feature Development Program starts September 25th. Our next Digital Filmmaking Program starts September 3rd. View student work and LAFilm on the news. Enter your email to join LA Film School Info List today! For more information, use our form, call or email us.